Heat oil in a pressure cooker. Add the sliced onions and stir fry for 2-3 mins till the onions become soft. Add the ginger paste and whole red chillies and fry for additional 2 mins. Add the radish and mix well with the onions and ginger. Now add the Pork slices and red chilli powder and cook for 2-3 mins. Add 1 cup of water and cover the pressure cooker and cook for 10-15 mins. Release the steam from the pressure cooker , open the lid and simmer for 10 mins till some of the water dries up. 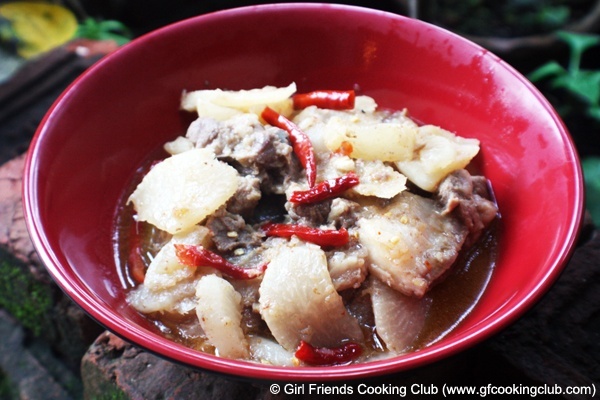 This entry was posted in Nepali Food Recipes, Pork and tagged Nepali Cuisine, Nepali Recipes, Pork with Radish by Kamakshi. Bookmark the permalink.